It’s been a very busy, but also a very successful week for Springwell Running Club with members achieving podium places, age category wins and personal bests at a variety of events. Always a very busy time of the year this week saw Springwell RC competing at Dessies 10k, the Castlederg 5k, the Portrush 5 Mile, the Rathlin Run, The Warriors Run, The Armagh City Marathon and finishing the weekend by ‘Storming the Castle’ with a 10k in Carrickfergus. Hosted by City of Derry Spartans, the Dessies 10k took place on Wednesday 22nd August at Gransha Park. This has always been a competitive event and 2018 was no exception as the cool overcast conditions provided almost perfect running conditions. Scott Rankin (Foyle Valley AC), the current NI & Ulster 10k and 10,000m Champion produced another impressive performance to lead from start to finish, winning in a time of 31.48. 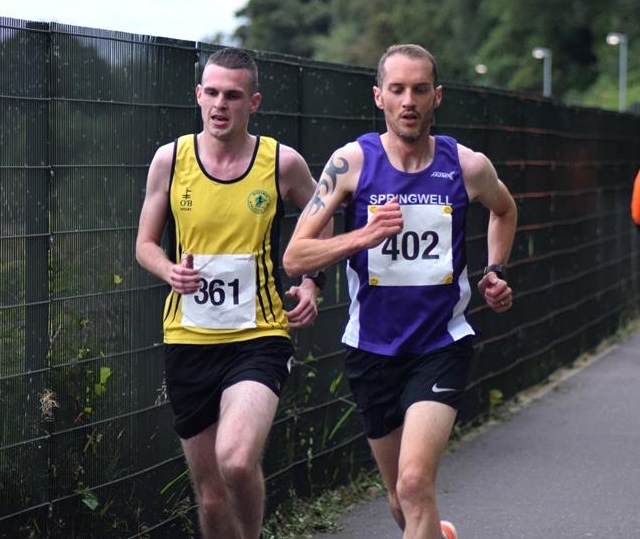 Kyle Doherty (City of Derry AC) was second in 32.16 with Eoin Hughes (Acorns AC) continuing his recent good form to finish third, in a new Acorns AC club record of 32.38. Steven McAlary (Springwell RC) ran a personal best of 32.40 to finish fourth, just two seconds behind Eoin. While he just missed out on the podium places Steven won the M35 age category. In the ladies race, Northern Ireland and Ireland international Ann-Marie McGlynn raced clear to win in an excellent 33.59. Ciara Toner (Springwell RC) had a very strong finish to take second place in 36.37, while Nikita Burke (Letterkenny AC) crossed the line in 36.44 for third. Springwell had another age category win at the event as Pauline Mullan ran 47.55 to win the F45 category. 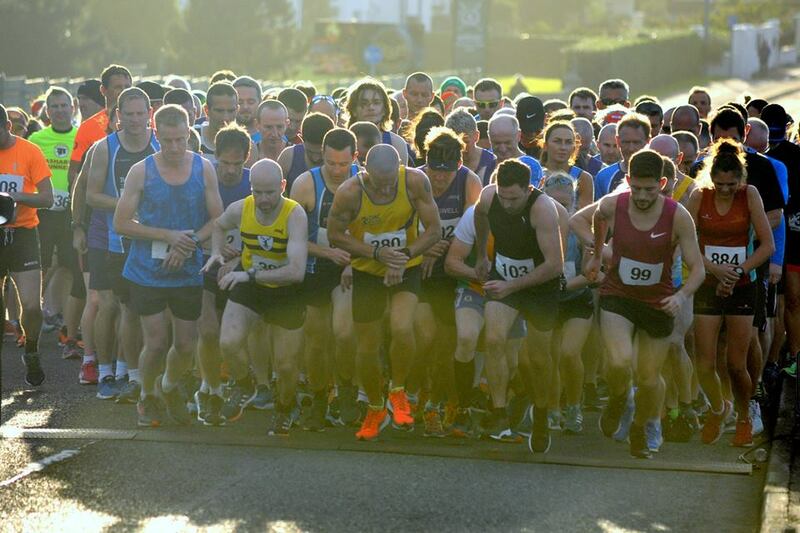 Organised by Mervyn Thompson in memory of his late father, the Portrush 5 Mile Road Race is a charity event raising funds for Prostate Cancer and the Alzheimer’s Society. This year’s race took place on Friday 24th August with over 270 runners taking part in the very scenic event. The showery weather, that had persisted during the day thankfully stopped as the field gathered on the Bushmills Road for the start of the race with competitors only having to cope with a blustery on shore wind. The course took the runners out the Bushmills Road and past the White Rocks before turning in the Magheracross Car Park, just before Dunluce Castle and returning to Portrush to finish on the East Strand adjacent to the Water Sports Centre. From the start it was Northern Ireland international Mark McKinstry setting the pace, as he took part in the event for the first time, securing a comfortable victory in 26.45. Chris McGurk of Glaslough Harriers followed in 27.16 for second, before Gareth Lyons (Ballydrain Harriers) finished in a time of 28.05 for third place. In the ladies race, Leann Gibson (Victoria Park & Connswater AC) won in 31.55. Faith Vinney (Bure Valley Harriers) claimed second place in 32.32, while Elaine Connor (Derry Track Club) took third place with a 33.55 just ahead of Karen McLaughlin (Springwell RC) who was fourth in 33.57. The Armagh City Marathon took place on Sunday 26th August, where the very wet and windy weather did little to prevent Chris Denton producing a great performance and yet another sub 3 hour marathon, winning in a time of 2.54.50. 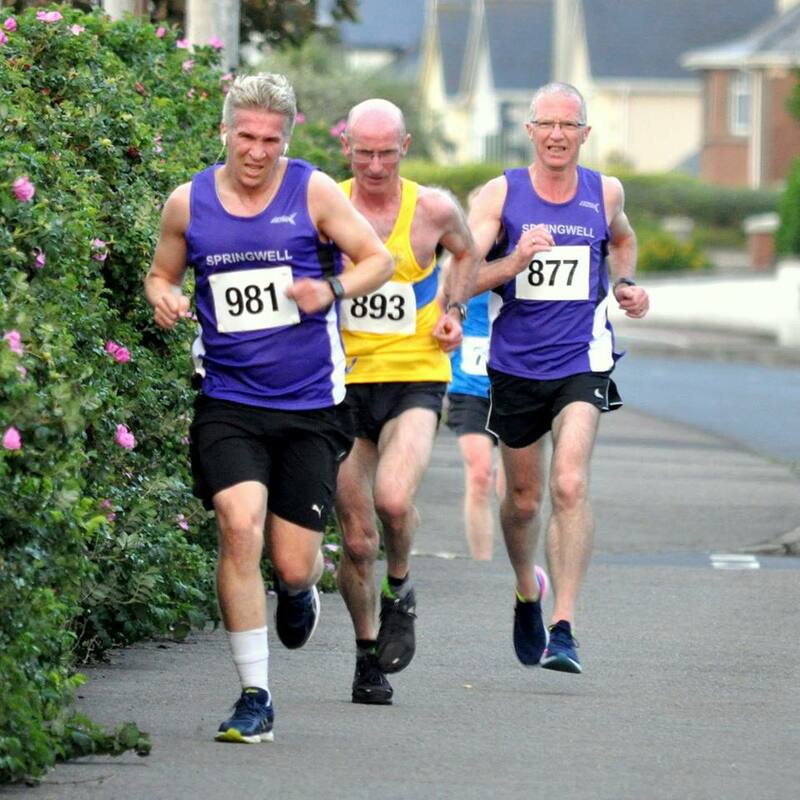 The Castlederg 5k on Thursday 23rd August saw Patrick Gallagher produce a personal best time of 19.06 to finish 6th overall and second in the senior male age category. At the Rathlin Run 5k on Saturday 25th August Will Colvin ran an impressive 21.32, on a hilly course, to finish second on the podium. The Warrior Run is a 15km race in Strandhill Village, which is just to the west of Sligo Town, where competitors race from the shore to the top of Knocknarea Hill at a height of 1070 feet before returning to the shore to finish. Catherine Byers took on this challenge and finished in 945th in a time of 1.59.11. The ‘Storming the Castle’ 10k, hosted by Seapark Athletic Club, took place on Sunday 26th August with over 800 runners taking part in this very popular event. The relatively flat course takes in the most scenic parts of Carrickfergus before finishing at the Castle. Springwell RC were well represented with a few taking on their second race of the weekend - 143rd Mervyn Thompson 46.07, 176th Mark Neely 47.48, 184th Clive Bradberry 48.02, 442nd Alison Kelly 55.56, 443d Laura Wilson 55.57, 539th Hayley Neely 58.52, 591st Amanda Scott 1.00.09, 592nd Elaine Montgomery 1.00.26, 600th Fiona Walker 1.00.47, 606th Deborah Archibald 1.00.52, 632nd Andrew Wilmot 1.02.03, 779th Jennifer Patterson 1.11.56.